Troponin is a complex of three regulatory proteins that is integral to non-smooth muscle contraction in skeletal as well as cardiac muscle. 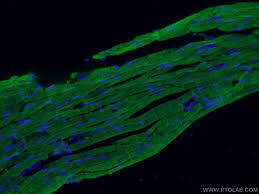 Troponin is attached to the tropomyosin sitting in the groove between actin filaments in muscle tissue. · Troponin-I is an inhibitory protein. Cardiac Troponin I is a cardiac muscle protein with a molecular weight of 24 kilodaltons. Cardiac Troponin T is present in fetal skeletal muscle. Cardiology research Journals like Clinical Cardiology and Cardiovascular Medicine (CCCM) provides a global open access platform to put forth the ongoing research, reviews articles related to all heart related disease, its treatment, case reports and many more. Review Article : Is Expanding Heart Always Serious?